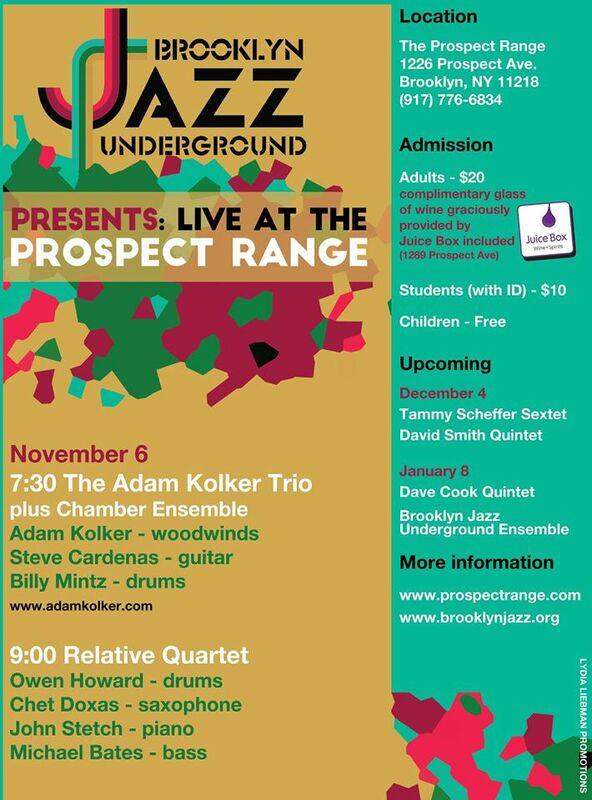 The Brooklyn Jazz Underground Presents Live at the Prospect Range on Friday, November 6, at 7:30 PM at the Prospect Range, located at 1228 Prospect Ave in Brooklyn, New York. Tickets are $20.00 for adults, $10 for students and free for children. More information ca¬¬n be found online by visiting www.brooklynjazz.org and www.prospectrange.com. The Brooklyn Jazz Underground, established in 2005, is an association of independent artists with a shared commitment to creativity and community. Through cooperative efforts, the BJU aims to build a greater awareness of original music emerging from Brooklyn, New York. The Brooklyn Jazz Underground is proud to present Live at the Prospect Range, a new concert series featuring artists from the collective, Brooklyn Jazz Underground Records and the Brooklyn creative music scene. The inaugural concert on November 6 will feature long-standing members of the Brooklyn Jazz Underground. At 7:30, The Adam Kolker Trio featuring a chamber ensemble will take the stage. Saxophonist Kolker, who has received praises from The New York Times (“a real improviser”) and All Music (“Kolker continues to stand apart as an inventive performer, composer and arranger with his brilliant reflections” for CD “Reflections”), will be joined by guitarist Steve Cardenas, drummer Billy Mintz and a chamber orchestra to perform new music composed and orchestrated for this ensemble. The second set, starting at 9:00, will feature The Relative Quartet, featuring drummer/composer Owen Howard, Saxophonist Chet Doxas, pianist John Stetch and bassist Michael Bates. Howard has been a mainstay on the New York Jazz scene for the past 20 years and most recently was honored with a prestigious Juno award nomination for his album “Drum Lore” (BJUR Records). Adult admission at $20 will include a complimentary glass of wine graciously provided by Juice Box, which is located at 1289 Prospect Avenue. Live at the Prospect Range will continue through December 4, on which date will feature the Tammy Scheffer Sextet and David Smith Quartet. The series will continue with performances by the David Cook Quintet and Brooklyn Jazz Underground Ensemble on January 8. Visit www.brooklynjazz.org for more information. ← BeBop Spoken Here Loves Racha Fora’s ‘Racha S’Miles’!